I was not an early adopter of Twitter. In fact, I was a skeptic. I remember how excited my colleague Laura Fitton (better known as @Pistachio with more than 50,000 followers) was about the platform several years ago and by the time she wrote the book Twitter for Dummies, I had just created a profile @ginarubel. Then, over the course of the two years, I learned as much as I could about Twitter, how it compliments public relations and marketing efforts, and how it integrates with other social media platforms. Before traveling to Denver, I connected online with LMA colleagues – many of whom I had never met in person but have followed, re-tweeted, become social media friends with, and interviewed for my blog on The Legal Intelligencer. I followed the Twitterstreme through #LMA10 and learned who was meeting where and when. There was a formal Tweet-up planned at Bubba Gump’s, there were meetings, dinners and events. Within hours of arriving and throughout the week, I had the opportunity to connect with legal marketing and social media experts across the country. I met great people and built new relationships with Heather Morse Milligan (The Legal Watercooler blogger) who shares a great perspective from the LMA conference, Adrian Lurssen (better known as JDTwitt) and Aviva Cuyler from JD Supra (which if you are an attorney and not on JD Supra, check out my previous blog Social Media for Lawyers Part 7: JD Supra). I spent time with my peer Jayne Navarre who I met once when she came to speak in Philadelphia. 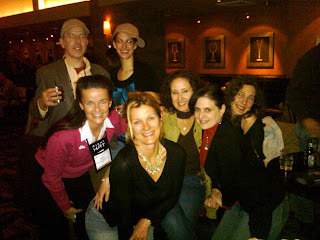 And I spent time connecting and building lasting memories with Rebecca Wissler, Lindsay Griffiths, Laura Gutierrez, Nancy Myrland, Lance Godard, Gail Lamarche, Lydia Bednerik, and Tim Corcoran (who I had met when he presented at a Philadelphia Bar Association Leaders’ Retreat). A number of us went to dinner at Roija and had a fantastic time learning about one another’s businesses, families, and lives – not to mention that it was one of the best meals I have ever had (if you ever go there, ask for Neil the server – he was fantastic). And on top of it all, I found out about Roija through Justin Bresler @jbresler, the VP of Marketing for Denver’s Convention and Visitor’s Bureau, who I was connected to via Twitter by Paul Bencivengo @scullyano who I know and follow from the Bucks County Convention and Visitor’s Bureau. So did you get all that? I posted a question on Twitter asking for recommendations to great restaurants in Denver. Paul sent me a tweet introducing me to Justin. I connected with Justin and he sent me an extensive list of great restaurants. I chose Roija and the rest is history. Another benefit of social networking. During the pre-conference I also had the pleasure and privilege to participate in the new program Just JDs: Business Development Strategies for Lawyers. I was invited to present by the Just JD organizer, Ross Fishman, CEO of Fishman Marketing, who I also met through social networking several years ago and have since done business with. As the CEO of Furia Rubel Public Relations and Marketing, I presented The Ethics of Public Relations and Marketing for Lawyers with John Hellerman, Partner and Co-Founder, Hellerman Baretz Communications. The full-day intensive also included fantastic business development, marketing, competitive intelligence and Web 2.0 programs by some of the best in the business including: James A. Durham, Chief Marketing & Business Development Officer, McGuireWoods LLP (and author of The Essential Little Book of Great Lawyering), Deborah Knupp, Partner of Akina Corporation, Alvidas A. Jasin, Director of Business Development of Thompson Hine LLP and Richard P. Klau, Business Product Manager, Blogger, Google. Another confession, I have since connected with all of the presenters on LinkedIn with the intention of keeping in touch. Overall, the Legal Marketing Association Annual Conference was better than any conference I have ever attended because I was able to connect in so many ways with colleagues and friends – all because of social media. A special congratulations to the conference organizers: Despina Kartson and David Freeman – they did a fantastic job! And the biggest confession of all is that I really enjoyed tweeting from all of the programs I attended. I hope that many others will benefit from the thought leadership by checking out #LMA10 on Twitter. You Rock! Agreed. LMA was all that and more. Your tweets were sooo helpful as I couldn't be everywhere at the same time #LMA10!. Content and comment. Insight on the IN-site! It's a talent. Thanks for the coverage. Let's keep the conversation going on our blogs. Too much good stuff to let it fade away. The best was connecting with you and my twitter folks. Funny how it works, you know their twitter profile pic, you see someone passing by and you shout out...hey I know you!!! It's great. Gina, I am so glad you came to the conference! You added so much to my experience, and that of many others who came in contact with your wisdom, your personality, your honesty and your ease of making friends. I can't wait to see you again, my new friend! I can't thank you enough and have already added 2011 to my calendar. What a great conference with wonderful minds!